1. Select the right tree for the site. To avoid serious problems, choose trees that are adapted to your location. Consider whether the tree produces nuisance fruit or if there are disease-resistant varieties available. For example, there are a number of crabapple varieties that are resistant to apple scab and rust diseases. Also consider the mature size of a tree to be sure you have enough room. Ask a local nurseryman for suggestions. 3. Before planting, remove all wires, labels, cords or anything else tied to the plant. If left on, they may eventually girdle the branch to which they are attached. 4. Dig a proper hole. Make the hole deep enough so that the tree sits slightly above nursery level. Plant the tree on solid ground, not fill dirt. In other words, don't dig the hole too deep and then add soil back to the hole before placing the tree. The root flare (point where trunk and roots meet) should be visible. If it isn't, remove enough soil or media so that it is. The width of the planting hole is very important. It should be three times the width of the root ball. Loosening the soil outside the hole so it is five times the diameter of the root ball will allow the tree to spread its roots faster. 5. Remove all containers from the root ball. Cut away plastic and peat pots; roll burlap and wire baskets back into the hole, cutting as much of the excess cut away as possible. If you can remove the wire basket without disturbing the root ball, do it. If roots have been circling around in the container, cut them and spread them out so they do not continue growing this way inside the hole and become girdling roots later in the life of the tree. 6. Backfill the hole with the same soil that was removed. Amendments such as peat moss likely do more harm than good. Make sure the soil that goes back is loosened - no clods or clumps. Add water as you fill to insure good root to soil contact and prevent air pockets. There is no need to fertilize at planting. 9. Mulch around the tree. THIS IS IMPORTANT! Mulch should be 2 to 4 inches deep and cover an area two to three times the diameter of the root ball. Mulching reduces competition from other plants, conserves moisture and keeps soil temperature closer to what the plants' roots prefer. 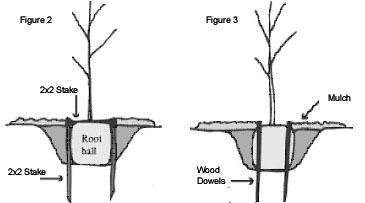 In Figure 2 above, one horizontal two-by-two is screwed or nailed to two vertical two-by-twos that have been placed against the side of the root ball and driven through the planting hole into the native undisturbed soil. A second set is used on the other side if needed for larger trees. In Figure 3 above, two or three wood dowels are driven through the edge of the root ball. These do not have to be removed because they simply rot in place. There is no danger of this system girdling the trunk since nothing is attached to the trunk. Both of these inexpensive alternate systems eliminate the requirement to return to the tree to remove the staking system because they simply decay in a few years.